Friden was one of the premier makers of mechanical calculators including the SRW, the first model that automatically extracted square roots. 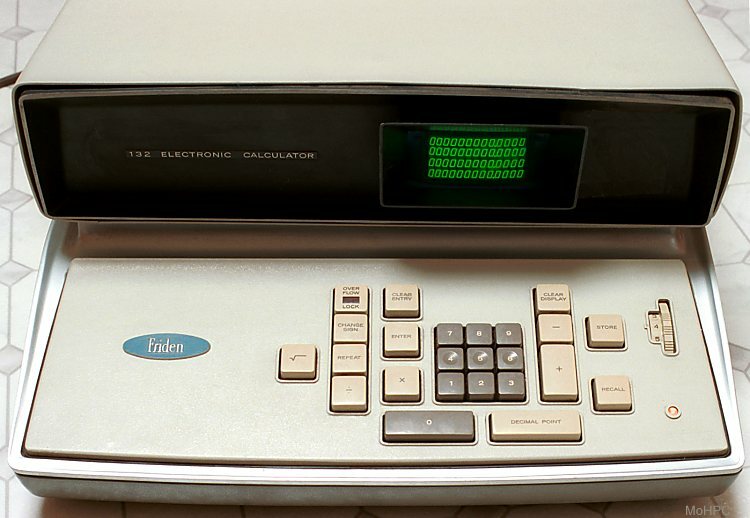 When they were released in 1964, the Friden ECs were among the very first electronic calculators anywhere in the world. These large machines had small CRT displays and relatively simple keyboards. Friden refered to the numeric part of the keyboard as "11-key" to indicate the addition of the decimal point to the usual 10-key keyboard. The calculator didn't have scientific notation (floating point) but did correctly place decimal points which was a major advantage over the earlier machines. The position of the decimal point was selected by a wheel that allowed 0-13 digits to be selected. The number of digits displayed after the decimal point was not merely a matter of display - there were no digits calculated after the decimal, nor could any be entered. 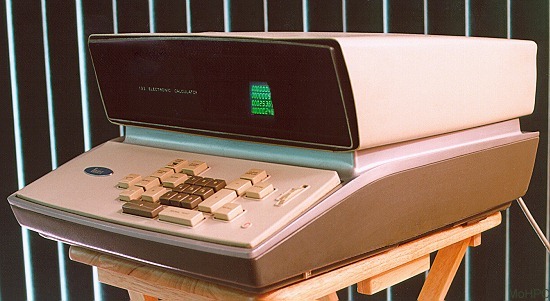 The calculators used a logic system that followed naturally from mechanical systems and was similar to HP's RPN. They had four stack registers numbered 1 through 4 which were all shown in the display and they had ENTER and REPEAT keys which, in combination, behaved like the ENTER key on HP's RPN models. They had no other stack manipulation keys such as swap or roll however. The EC-130 implemented the four basic math functions and the EC132 added square root. (Using square root caused the contents of stack register 4 to be lost as a side effect.) Besides the four stack registers, the calculator had a single memory accessed by the STORE and RECALL keys. (Store moved rather than copied the number in register 1 to the memory unit.) If entries or answers exceeded the capacity of the machine, the OVER FLOW LOCK button lit and the keyboard was locked until the OVER FLOW LOCK, CLEAR DISPLAY, or CLEAR ENTRY key was pressed. The calculators felt like their mechanical predecessors in many ways. For example, when performing a mathematical operation, the operation key was mechanically held down and released only after the calculator was finished - a process which could take two seconds for some operations. They would also go into an infinite loop if the user requested a divide by zero. The Clear Display key could be used (like the Div stop key on the calculating machines) to break the loop. 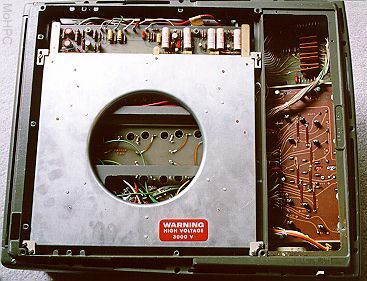 Like the HP-9100, these machines used all discrete components. 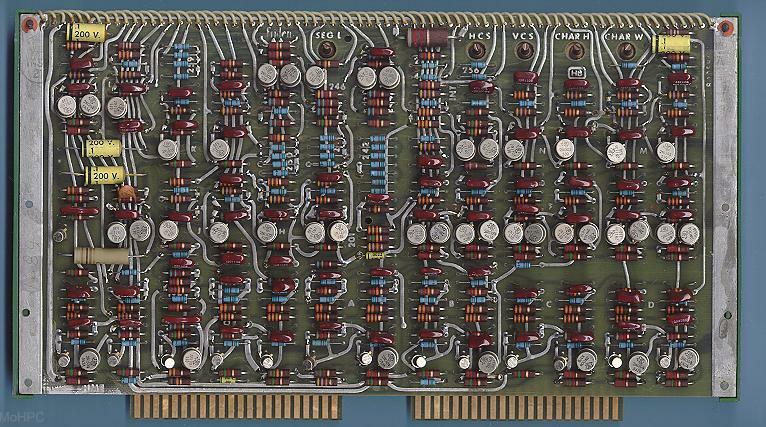 The interior top view shows the 8 main logic boards. They were inserted in pairs with each pair connected by about 75 individual wires. These four board pairs plugged into slots in the main board. Unlike the HP-9100, there was no core memory. Instead there was an even older device - a coiled acoustic delay line with magnetostrictive transducers. Magnetostrictive materials have a coupling between their magnetic and mechanical states - a change in one state causes a change in the other. This is analogous to the piezoelectric effect. A transducer at one end of the wire input data as pulses which proceeded at the speed of sound to the other end where they were read by another transducer. The data read from the output transducer was filtered, amplified and then fed back into the input transducer. This allowed a few milliseconds of acoustic delay to behave like permanent storage. The amount of memory available depended on the length of the wire and the filtering techniques used on the output side. 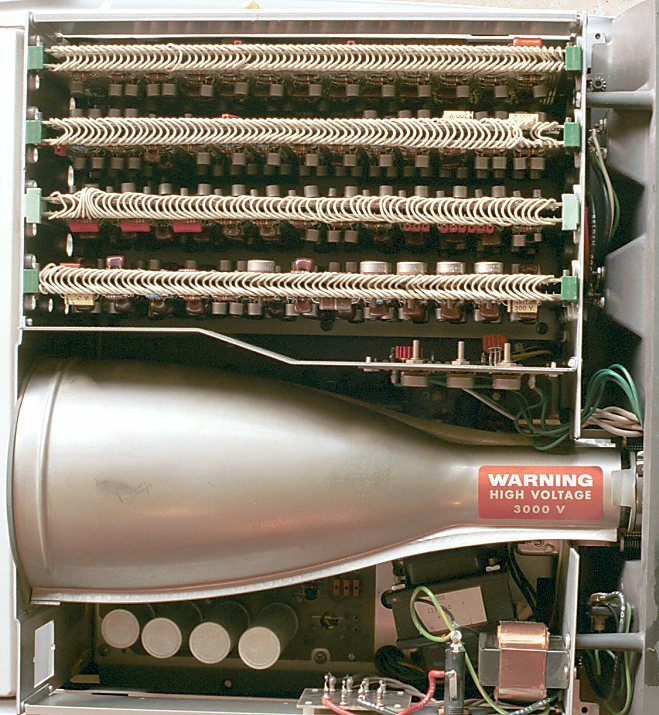 Acoustic delay lines were common in the early days of computing. Magnetic cores obsoleted them long ago in computers but they can still be found in modern analog applications. For example, having a delay line equal to the length of one video line allows a VCR to hide tape dropouts by replacing them with the signal from the line above.